In 2003 the people from Retro Remakes organized a remake competition for the first time. The idea was to create a remake from scratch in a short amount of time. We decided to participate with a remake of the MSX game Road Fighter: a simple racing game that would be doable before the deadline and still be fun to play (oh the nostalgia!). If you have any problems, questions or suggestions about Road Fighter, feel free to join us at the Braingames forums, or even better, at the Road Fighter forum. The forum is the place where you can find the latest developments, send us your contributions, send us fanmail or for just a friendly chat. You're welcome to join us! Updated the Ubuntu builds to 8.04, 8.10 and 9.04 and created a Universal Binary version for OSX. Nothing much here, apart from a new website, some small bug fixes and binaries for Mac OSX (Intel only) and Ubuntu/Debian. Here you can see some screenshots of the game in action. 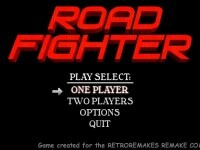 The Road Fighter remake is available for Windows, Mac OS X and Linux computers. We provide binary versions for both Windows and OSX, for Ubuntu/Debian you can download a .deb file. For Linux or other computers you can download the source code for the game. You can download the remake from our primary server or our mirror. File size is about 5MB. You can also try one of the nightly SVN exports for the most current version. GAME A is for beginners. You will want to choose this when you play the game for the first time. GAME B is for advanced players. The game is quite hard to finish in this mode. GAME C is for crazy players. In this mode you will have serious problems to beat the game! During the race, you should try not to hit the borders of the road. Beware of the other cars, because they sometimes will try to push you to the border and make you crash. Another important issue is the fuel. You should try to collect all the fuel recharges that you can during the game. They are represented by the pink hearts. You can also play the game with 2 players at the same time in split screen mode! These are the default controls of the game. They can be redefined in the options menu. In the game you drive the red sports car. If you are playing in 2 player mode, player 1 will drive the red sports car and player 2 the yellow one. During the race fuel charges will appear on the road in the form of pink hearts. Pick them up for more fuel and bonus points. During the race you will encounter other cars on the road. There's different types of cars. The drivers in the green cars are unlucky enough to be on the same road where your crazy race is taking place. The blue cars are your opponents; usually you are faster than them but don't get overconfident: sometimes they can suprise you! Last of all are the drivers in the purple cars. They are very suidical and will try to crash into you when you overtake them. You'd better avoid these big slow driving monsters! Be careful of the water, oil and rock that sometimes appear on the road. Water will slow down your car whereas oil will make your car spin. And crashing into a rock at full speed is of course a very bad idea!